In 2012 it only cost 40,000 British Airways miles (now Avios) to fly from the US to Easter Island and back. A roundtrip ticket to Easter Island for only 40,000 miles. And British Airways offered unlimited stopovers for award tickets. Of course my husband and I took advantage of that and made a trip from the U.S. to Chile hitting both Valporaiso and Santiago before then flying to Easter Island for almost a week, then on to Peru to finish up with a visit to Machu Picchu. It was an incredible trip. Easter Island has a mysterious mood that hovers around the place like luminous gray clouds, eerie and beautiful at the same time. But if I ever want to include Easter Island in my travels again, I would need a totally different strategy. Why? Because the rules have changed. British Airways changed their program a few years ago so that it now bases its award prices on distance rather than zones. Back when we made our trip, Easter Island was such a good price because it was considered to be part of the same pricing zone as Chile, despite being quite a bit farther. Now instead a ticket’s award price increases if the distance increases. “Unlimited stopovers” is a great perk for a zone-based award chart. Under the new pricing model, you basically pay per leg of the trip. So a new stop creates a new leg and that is how your price accumulates to its total. There are some cases where this isn’t true, which you can read about in Drew’s post about booking stopovers to save Avios. But in general, adding a stop will increase the distance and thus also increase the price. 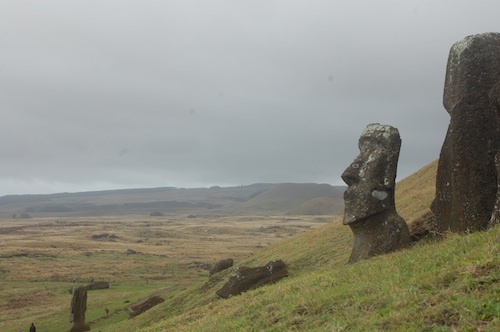 Other Airline Mileage programs now also include Easter Island in a different pricing zone than Chile, despite its technically being part of Chile. For example American Airlines considers it part of the same pricing zone as the South Pacific Islands like New Zealand. Geographically that makes more sense but it’s a bummer for anyone hoping to get to Easter Island on the cheap! Even though part of our motivation for visiting Easter Island had to do with the great deal we recognized in its only costing 20,000 miles, I still definitely recommend visiting it at least once. And here’s why. Easter Island is incredibly mysterious and unlike any other island I’ve visited. It is so defined the mysterious Moai statues that cover whole fields and stare inward towards the islanders with blank, un-telling faces. Unlike Fiji or The Cook Islands or Phi Phi Island, it’s not necessarily the landscape that draws guests here. It is the blatant sign of some incredible yet inaccessible past. It’s like no other place. Once you get to Easter Island, it is not impossible to experience it on a budget. To see the various Moai sites you will need some form of transportation but car rentals are reasonable (somewhere around $20 for the day) and actually the island is small enough for a bike rental to be sufficient if weather allows. And for accommodations, there are home-stay options as well as cheap camp-sites with some of the best weather-proof camping gear I’ve ever seen. 75,000 British Airways Avios is the current estimation for a roundtrip ticket from North America to Easter Island. (For this estimation I used Wandr.me’s Avios Calculator tool.